HANOVERTON, Ohio — This year the Hicks & Hayseeds 4-H club will be offering a “Hanging Out in the Garden” silent auction basket at the Columbiana County Fair. The members constructed a wooden trellis, a bird house, a bird feeder, cement flower pots and cement candles holders. Other items included are various other tools and garden decorations. The basket can be seen in the Junior Fair Building at the fairgrounds. Bidding closes on all of the baskets at 5 p.m. Aug. 3. The money earned goes to the county 4-H office to benefit all of the clubs in the county. CANFIELD, Ohio — Following several county judging events in July, Western Reserve Rangers 4-H members were congratulated for the awards they received. Representing Mahoning County at the Ohio State Fair in one project area will be Abigail Schors, Tiffany Voland, Shannon Marshburn, Ian Hames, Richie Hedrick, William Reph and Erin Styka. Competing at the Ohio State Fair in two project areas are Alyssa Higgins, Jena Styka, Emily Smith, Karl Reph, Emma Reph and Olivia Reph. 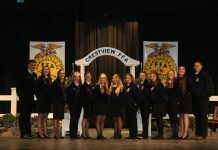 State fair alternates include Olivia Haid, Tiffany Voland, Camille Kirk, Reese Snyder and Jessie Cummings. Receiving county award ribbons were Shannon Marshburn, Tiffany Voland, Taylor Smith, Olivia Haid, Remi Suyen Mikan and Bailey Hornberger. During the July 4-H meeting, Levi and Emily Smith recapped the time they had at Ohio 4-H Leadership Camp. Emily, also a county fashion board member, reported on the success of the county style revue. There will be two workshops in August at the home of club advisers Jan and Kathleen Moser. On Aug. 3, livestock members will be completing new club signs for the Canfield Fair, and on Aug. 17, members will be making dresses out of pillowcases for the “Dress A Girl Around The World Project.” Both workshops are from 10 a.m. until noon. The club will meet again Aug. 8, at 7 p.m. Club member and advisers will be hosting 4-H families and each family is asked to bring a snack to share.